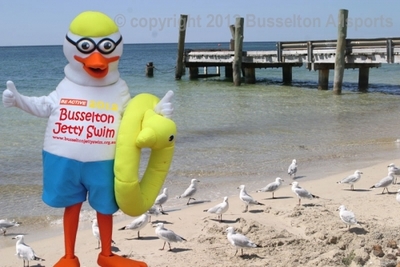 Take the opportunity to participate in this swim around the iconic Busselton Jetty next weekend Sunday February 10th! The 3.6km swim has been operating since 1996 and has grown immensely in popularity, going from a local event in our south west to an internationally recognised event which now attracts over 1000 competitors which will be capped at 1500 in 2013. If you are not up to the swim you could take the opportunity to volunteer or simply enjoy the many activities that are on offer over the weekend - including entertainment, family friendly fun and many fun activities on the beachfront. Swimmers need to arrive at 7.15am for an 8am start and an estimated 11am finish time. Entry fees and more details can be found here including activities on offer and registration times. Entries close Wednesday February 6th at 11.59pm. There is an opportunity to win a cash prize of $1000 for the first swimmer to break the 40 minute record! It was nearly achieved last year, so for those competitive swimmers out there this adds an extra challenge/incentive. This year's swim also has a Gilligans Island Theme, which will undoubtedly make it more fun and colourful than ever. Every swimmer to finish the course receives a finisher's award as a keepsake and a reminder of their achievement. So if swimming's your thing! Head to the above mentioned website to register in this great event at Western Australia's iconic Busselton Jetty. A beautiful part of W.A coastline.